Sensitive skin that’s prone to redness needs special care from extra-gentle skincare products. 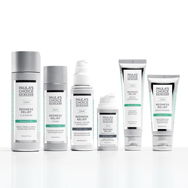 That’s why Paula’s Choice formulated our two CALM collections: Each complete routine (for normal to dry or normal to oily skin) replenishes, soothes redness, renews and refines skin plus provides proven, non-irritating anti-aging ingredients. Whether you choose one of our CALM collections for normal to dry or normal to oily skin, each fragrance-free product contains a specialized blend of gentle yet effective ingredients that work to calm extra-sensitive skin, even for those with rosacea. What you’ll find in every CALM product are skin-replenishing ingredients such as glycerin, ceramides, and hyaluronic acid (don’t let the acid name scare you; this is one of the most brilliant hydrating ingredients in the world of skincare). We’ve also included ultra-soothing antioxidant plant extracts such as oatmeal, licorice extract, burdock root, sea whip extract, beta-glucan, chamomile, willow herb and epigallocatechin gallate. All of these have research showing them to be exceptional calming plant extracts. Each of these ingredients work to smooth and renew skin’s surface, helping to diminish redness and lessen sensitivity. We also enriched our CALM products with an impressive mix of anti-aging ingredients that your skin will love. Which CALM collection should you choose? Select your CALM routine based on your underlying skin type. If you have normal to oily skin, choose the CALM collection for normal to oily skin; if you have normal to dry skin, choose the CALM collection for normal to dry skin. With ongoing use, you will soon be seeing your complexion return to a healthier, comforted, younger looking appearance. No more being shy about looking in the mirror—or looking like you’ve applied too much blush in strange places! Those of you familiar with Paula’s Choice know that we’ve said for years that all of our products are suitable for sensitive skin. So, how do the CALM products differ? Great question! The CALM products are designed specially for those who have extremely temperamental skin that’s also prone to redness—the kind of skin that’s intolerant of many skincare ingredients and even the ones we love in our other products. Another difference you’ll appreciate is our CALM collections contain a broader assortment and higher amounts of ingredients research has shown can bring about soothing relief to uncomfortable-feeling, warm-looking skin. What if you want anti-aging ingredients, too? Don’t worry, the best and gentlest ones are in all our CALM collections too, so you’ll see more hydrated, radiant, firmer-feeling skin with diminished appearance of lines and wrinkles, too! Step 5: CALM Redness Relief Moisturizer (apply to the neck and around eyes, too, or you can dab on RESIST Anti-Aging Eye Cream if the skin around your eyes is drier than the rest of your face). Note that you do not need to wait between any of these steps before applying the next product. However, if you prefer to wait, that’s fine, too—it’s about personal preference, not formulary necessity.